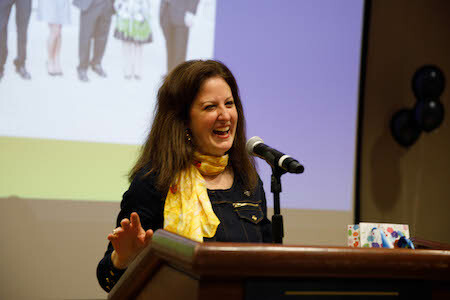 The Presidential Fellowship celebrated its annual alumni reunion on Friday, October 26th during GW’s Colonials Weekend. The current Fellows, the Advising Team, and dozens of alumni & guests gathered together to rekindle old bonds, celebrate the program’s legacy, and toast to the program’s future. We were also joined by GW’s president, Dr. Thomas LeBlanc. The Fellowship convened this year’s reception in the Marvin Center Continental Ballroom. We are grateful to the Office of Alumni Relations for their generous support of the reception. President LeBlanc discussed a variety of recent developments at the University and attested to the contributions of the program. 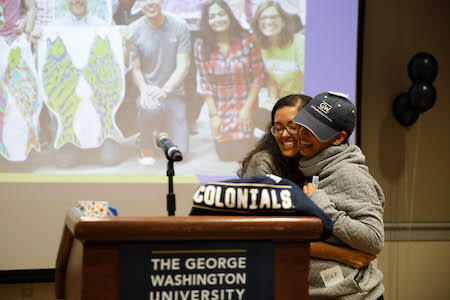 He emphasized that Fellows remain ambassadors for the University beyond graduation and encouraged alumni to continue displaying their pride and supporting GW. Robert Snyder (GWSB BBA '95, GSEHD EdD '17) was honored for his six years of service as Director of the Presidential Fellowship. Toby Davidow (GSEHD M.A. 2000, GSEHD Ed.D. 2014) was surprised by the current Presidential Fellows for her 10 year milestone for the program. PAF ‘08 Alum Steve Roche (CCAS BA ’06, MA ’08 or PAF ‘08), who currently works in GW’s Office of Alumni Relations, discussed ways to stay connected to GW anytime, anywhere. Steve Roche’s call to action was in-line with current Fellows’ efforts to engage our alumni outside of the Washington, DC metropolitan area. Moreover, the current fellows would like to recognize our alumni for their volunteer contributions outside of the program that strengthen the GW community. Here are just a few ways to get involved. Make a gift – of any amount - to the Presidential Fellowship Professional and Academic Development Fund or any GW department/program/student organization of your choice. Request access to the GW Presidential Fellowship Alumni Group (private). Posting in the Presidential Fellowship’s LinkedIn group and inviting other alumni of the program to join. Send your resume to [email protected] as part of our initiative for current Fellows to review resume samples as we perfect our own and consider how best to represent the Fellowship among our activities and accomplishments. Submit a milestone to [email protected] about your personal and/or professional activities to be included in an upcoming Presidential Fellowship alumni newsletter. Help us update the Alumni Fellows section of the website by filling out this form. Keep us up-to-date with your current contact information. 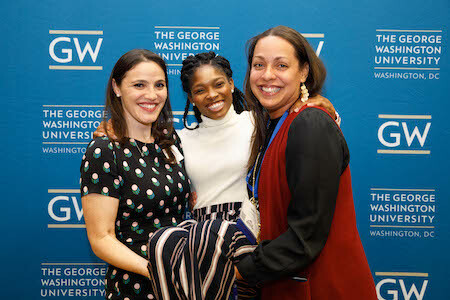 For a visual repository of the evening’s festivities, please feel free to visit our GW Presidential Fellowship Alumni Group on Facebook to access the full photo album.